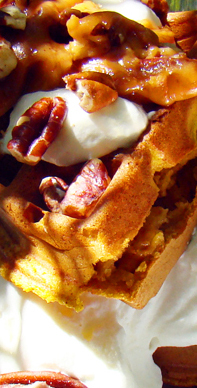 Ok, so waffles may not be dessert, and we're doing pumpkin desserts this week. They're traditionally breakfast, but they SHOULD be dessert the way they're served today! These delicious pumpkin waffles are topped with a buttery, caramel pecan topping and stuffed with lots of cream cheese and whip cream filling! They are truly decadent. 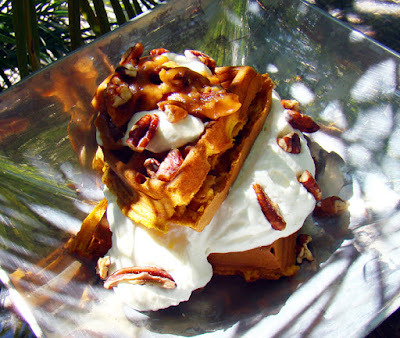 When its time to wake up and indulge, this recipe is the clear winner! Combine flour, baking soda, baking powder and salt in a large mixing bowl and whisk until ingredients are combined. Add pumpkin, vanilla, brown sugar and pumpkin pie spice and mix with electric mixer until combined. Continue to mix with electric mixer and add eggs one at a time, milk slowly, cream cheese and melted butter. Mix until smooth. Ladle batter into heated waffle iron and follow manufacturer's instructions for cooking waffles. When cooked, place on a cookie sheet in the oven at 250 to keep warm and crisp until ready to serve. FILLING: Combine cream cheese and whip cream and mix with electric mixer until smooth. TOPPING: Combine caramel, butter and pecans in a small microwaveable bowl and heat on medium heat for 30 seconds at a time, stirring often until desired thickness and heat are reached. TO SERVE: Place one waffle square (or 1/4 circle) on a plate. Spoon about 1/4 cup of the cheesecake filling on top of waffle. Place another waffle on top of filling. 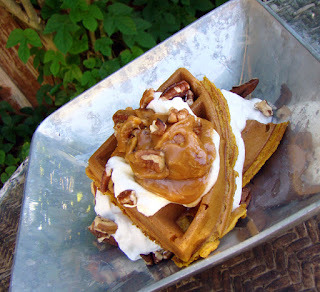 Spoon caramel pecan sauce on top waffles to finish. Serve immediately. Yummy! I'm ready to make these for breakfast and serve with sausage links. C'mon Sunday morning!!! !